72 MORE Ways Not to Stipple of Meander in French and in Colour! Here it is - finally 72 MORE Ways in French and in colour. 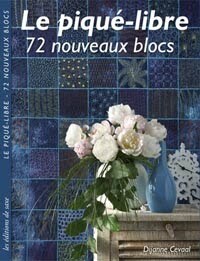 My french version of my first 72 Ways book is now out of print and this book has been released in time for the Carrefour Europeen du Patchwork. I love the styling they do of the photographs, it makes the whole quilt look so French! Thank you Clarisse and the team at Editions de Saxe. I am also getting close to having a linocutting book done, I have been working on more exercises- but because of coloured photos ,it is not something I can self publish unless it is on cd/dvd.I was really surprised to see a number of images for the on-line linocutting class appear when I googled linocutting- very satisfying to see the participants linocuts and prints stand up so well with other linocutting images! I have not got the right adaptor plug to charge the battery for my camera- so I cannot take photos. So I am sharing some of my encounters with textiles in Syria on my recent Creative Arts Safaris trip. Silk was once a trading product produced in Syria and much of the lush Ottoman silk fabrics which one can still encounter in museums, were produced in Syria. There was a thriving silk industry which has dwindled to perhaps half a dozen producers in small villages in the countryside..We have been lucky to find one of the artisans and to be able to see the whole process from mulberry leaf to silk worm to spinning the silk yarn to weaving and the creation of scarves and crocheted tops. The white mulberry tree the leaves of which are used to feed the silkworms. Silk worms feasting on mulberry leaves on specially made dishes which prevent the worms from escaping. The worms beginning to spin their cocoons. In the spinning process the silk thread is wound onto a wheel for easier reeling afterwards. I love that this family used such simple but effective equipment- no whirring machines here, just age old equipment. The silk wound onto reels. Weaving the silk on a narrow loom which has been sunk into the ground. This family has been weaving for many generations and it is being passed on to the children. Voila - finished products- all hand made! I loved being able to see this whole process, I know you can read about it in books, but it is not the same somehow. Of course a wonderful hand woven scarf, made wider with a crocheted seam had to come home with me and thank goodness I have had it in this cold nasty and wet winter weather!The family were hospitable and passionate about their silk. Of course we were treated to a cup of coffee and traditional home made biscuits! If you are at all interested in the tour of Syria more information can be obtained from Creative Arts Safaris- I will be your creative tutor on the trip! I finished this little bag a couple of days before I left France for Australia. Thank you everyone who sent condolence wishes, it is much appreciated.. I tried to reply to everyone personally but some I can't as the reply is no reply.The funeral was last friday and took a lot of organising, and also settling affairs it all takes time. I have a really urgent request. A friend in Redcar, England carried the My Place quilts in her luggage to help me carry over so many things late last year. I haven't had a chance to visit her to pick up the quilts ( Redcar is in the north about an hour and a bit from Leeds) I was supposed to have taught a workshop there tomorrow and pick up the quilts but because of circumstances i cannot do that. Is there anyone out there who could bring the quilts from Redcar to the Festival of Quilts where they can deliver them to a friend who will take them to Belgium for me? I know it is a long shot but i thought it worth asking. 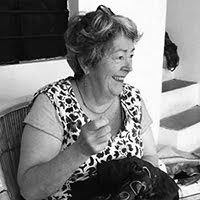 I am heading home to Australia for 3 and a bit weeks- my mothers long time partner Serge Lajoie passed away very suddenly whilst they were holidaying in his favourite spot in Queensland. He made my mother very happy, he was a loving grandfather for my children and now I will never see him again. Vale Serge you were truly a gentle man. 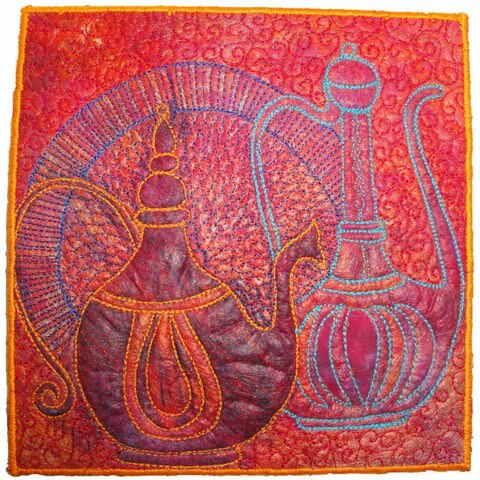 it is a while since I made a teapot and Rosewater Jug piece. I actually had to make a new linocut as my old linocut is still in Australia, and I accidentally reversed it. Anyway this piece has been printed on lutradur and has been machine stitched. 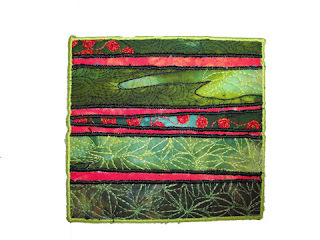 It measures approximately 20 cm square and is for sale for 45Euros. 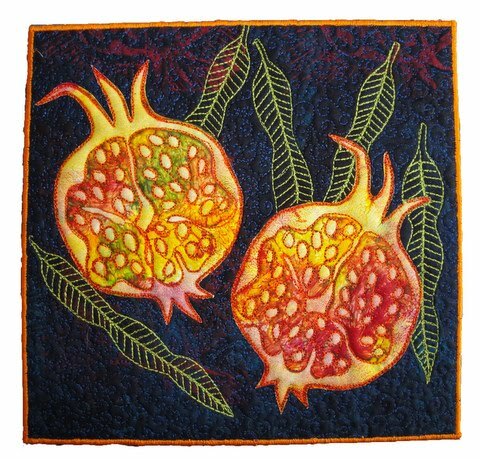 I have also been making pomegranate pieces as well- it is nice to mix up the sewing. this one measures 23cm square and is for sale for 45 Euros. The pomegranates have been hand printed and the piece has been machine stitched. This little piece is entitled Little Fairy Forest.It measures 15cm x 15 cm and is for sale for 30 Euros. I went and picked up the Southern Lands exhibition from Centre European du Patchwork last Saturday. Unfortunately not many pieces sold but it does mean we have a smashing exhibition available for exhibition should anyone be interested. The exhibition was very well attended and we received a lot of positive comments. so if you are interested in any of the things in this post please email me.